I alluded to this brush in this week's monday musings but after using it for a few days, I decided it deserved a post of it's own. Why not add to the plethora of reviews that are already out there about this bad boy?! I should preface this all by saying that $50 for ONE makeup brush is a hefty price tag. I don't care if it's made out of unicorn feathers (goat hair actually), that's a lot of money. So the fact that I took the bait and purchased this thing is really saying something. 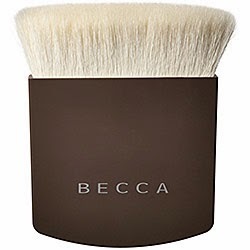 I stumbled upon this brush during your average Sephora browsing binge. From the image, it's impossible to tell how huge it is (the size of your palm). When I clicked over, I was intriqued but knew I needed more research. How could this brush replace practically all my other brushes? I did a quick google search and was inundated with reviews and videos. Sephora made a video tutorial of how to use this brush and I was amazed. It looked to quick, easy, and foolproof. But, being the skeptic that I am, I did a little more searching for some reviews that didn't come from the brand or source. I found tons of posts about people raving about this brush and saying that it really was worth the investment, goat hair and all! I bought into the airbrushed look that this brush promised and the time saving techniques demonstrated in the video. After going to 2 Sephora's to find it, I made the purchase and headed home to test it out. I can honestly say, I was impressed. I used the brush to apply my primer, tinted moisturizer, bronzer, blush, and highlighter. It worked like a dream and gave me a much more even, flawless look. I feel like I'm using less product but getting more payout. I love the fact that I'm not pulling and tugging on my skin to apply the products. So here is your public service announcement - if you do one thing this weekend, it should be to invest in this brush.